Denominational communications and publishing were the topics as the board of directors of the Brethren Missionary Herald Company kicked off their fall meeting in Winona Lake, Ind. on Thursday afternoon (November 8). Joining the board for lunch and conversation were representatives of the Baptist General Conference (BGC) from Arlington Heights, Ill., who discussed their publication and book store operations. 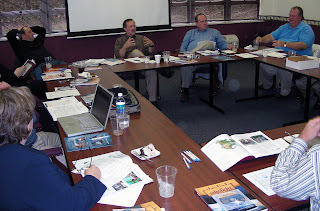 In the photo, Gary Marsh, director of publishing for the BGC, describes the communications arm of their denomination. Left to right are BMH board member Nathan Bryant, Marsh, BMH Executive Director Terry White, and BMH board member Pat Phillips. Joining Marsh in Winona Lake was Bob Putman, editor of BGCWorld, and Scott Nelson, director of Harvest, the denomination’s online bookstore. In addition to Bryant, of Milton, Ont. and Phillips, of Bexley, Ohio, BMH board members at this week’s meeting include Todd Scoles (president) of Dublin, Ohio, Bob Arenobine of Fort Wayne, Ind., Nathan Harrison of Gahanna, Ohio, and Rick Fairman of Lancaster, Pa. Not able to attend are Bruce Barlow of Winona Lake, Ind., Dan Thornton of Soldotna, Alaska, and Barb Wooler of Winona Lake, Ind. The board continues to meet through tomorrow.